Isn’t it remarkable how nature is able to do things right the first time? That’s the primary driving force behind aquaponics systems. The truth of the matter is aquaponics systems are some of the most dependable, some of the longest-lasting, as well some of the most efficient food production systems on the planet. “But what exactly are they?” you might be wondering. In essence an aquaponics system is an aquarium that makes food. Really, that’s it. What you have with this kind of system is a closed system relying on fish, water, plants, and simple plumbing to provide food for you on a year round basis. Now these systems are far superior to most other food production systems. Unlike traditional farming which requires both nutrients and water to be pumped in from an outside source, an aquaponics system has everything right there where you need it. At the bottom of an aquaponics system are fish in a tank (aquarium) of water. These fish are there for one simple purpose…to act and live as they would in the wild. That means they eat, sleep, and relieve themselves as usual. The interesting thing about an aquaponics system is what happens to the waste produced by the fish. Now as you remember from science class there are three things plants need to stay alive are 1.) water 2.) nutrients 3.) light. And in an aquaponics system they get all three. Remember when I mentioned something interesting happens to the waste products of the fish? Well in an aquaponics system the water the fish is in is transported into the trays where the food is grown. Inside of the water transported to the plants is the waste matter from the fish. That waste matter is chock-full of valuable nutrients the plants need to grow. Plus the water that’s pumped out of the fish’s tank is then absorbed by the plants further fueling their growth. The water that doesn’t get used then drips back into the tank beneath it and “voilà” the fish continue to swim in it, eliminate waste into it, and grow at the same time. The really incredible part about all of this is just how much food you can get from these systems…and not just the plants growing above the fish. That’s right, the fish you have feeding the plants can even be used as food. As far as any outside input needed to make an aquaponics system work you need very little. You’ll need fish feed to feed the fish. This is relatively inexpensive. And you’ll need light. Either natural sunlight or some kind of artificial light meant to mimic the sun’s rays. Other than that you’re pretty much set to go. Perhaps one of the coolest parts about these systems is they’re self-cleaning. 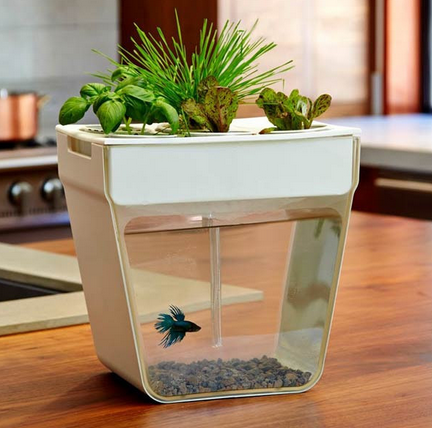 Unlike normal aquariums which require frequent cleanings to keep your fish alive, the plants in the system actually help to clean the water significantly. Meaning cleaning is set to a minimum. Aquaponics systems are also scalable in terms of size. You can do desktop sized ones to grow smaller food items or you can do giant installations as large as a warehouse. We have a desktop aquaponics system. This entry was posted in Emergency Survival, Prepping, Survival Cooking, Uncategorized and tagged aquaponics, food, survival food on September 14, 2015 by Survival Frog. Certainly a good start . What about something on a larger scale? What would it entail? Not much else. Just more feed, fish, pumps, and water. Aquaponics is easily scalable for larger operations without more complication.